College & Research Libraries recently published the results of a 2015 survey of academic librarians measuring their attitudes, involvement, and perceived ability to conduct academic research. This report provides an update to a similar study completed in 2010. The survey questions covered four topics: reading and conducting research, confidence in conducting research, training in research methods, and institutional support. Over 4 in 5 (84%) of the academic librarians surveyed say that they are expected to read academic research on librarianship as part of their jobs, and about the same portion (80%) say that they are given time on the job to keep up with research. However, a little less than 3 in 5 (58%) respondents say that they regularly read the full text of research articles. Along with reading relevant research, about three-quarters (77%) of respondents have conducted their own research since completing their MLIS. To measure confidence, respondents ranked themselves from 1 (not at all confident) to 5 (very confident) on several steps of the research process. The academic librarians responding to the survey were confident in completing many steps of the research process – most respondents answered that they are “very confident” in tasks like determining the appropriate research methods to use, using relevant keywords to find literature relevant to their research, and gathering data. 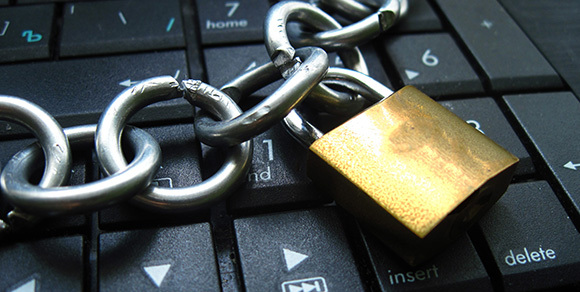 Confidence falls when it comes to analyzing data. Half (50%) of the respondents say that they are “not at all confident” in knowing which statistical tests to run. A similar number (53%) of respondents reported taking any course in statistical analysis, and about half (46%) of those respondents took that course as part of their undergraduate degree, not as part of the MLIS. Given the lack of statistics training as part of the MLIS, perhaps it is not surprising that less than 1 in 5 (17%) respondents feel that their MLIS program adequately prepared them to conduct original research. The 2010 survey led to the creation of the Institute for Research Design in Librarianship (IRDL), a continuing education opportunity for academic and research librarians to learn the components of the research process. IRDL will be accepting applications for their 2019 Institute starting December 1. The full report of the 2015 survey can be found here. The Metropolitan Policy Center at the Brookings Institution recently published an analysis of data gathered by the U.S. Census Bureau’s American Community Survey concerning national broadband internet adoption, including cable, fiber optic, or DSL internet service. They found that while broadband subscriptions are rising, there are still gaps in this essential service. Brookings’ analysis found that, overall, people in the U.S. are rapidly adopting broadband technology. 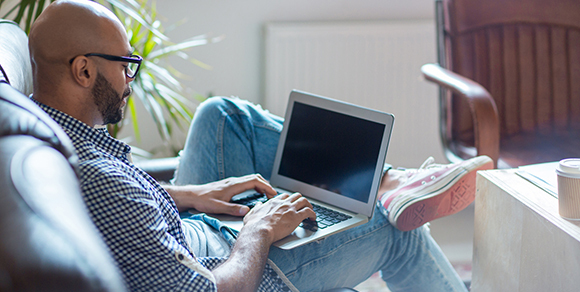 In 2013, about 7 in 10 (73%) households across the U.S. had a broadband subscription. By 2017, broadband subscription had jumped to about 8 in 10 (83%) U.S. households. The national picture matches that seen in the 100 largest metro areas, which saw a similar jump from a 75% broadband adoption rate in 2013 to 86% in 2017. Metro areas that had low adoption rates in 2013 tended to see the most growth – areas like El Paso, TX (64% to 81%), Jackson, MS (65% to 82%) and Youngstown, OH (64%-80%). In El Paso, this means that about 50,000 more households had access to in-home internet in 2017 than did in 2013. Access to quality internet is becoming increasingly important in the United States and is required for everything from completing web-based homework to applying for jobs, which is a problem for the 2 in 10 households that still do not have home internet. Some estimates have shown that libraries and other community institutions are key to filling in these gaps in broadband access. And, until every home has access to quality internet, libraries have the opportunity to provide this service and ensure that everyone is able to fully participate in an increasingly digital society. Since the survey was last administered in 2012, there were several key shifts. In 2018, 70% of respondents reported using social media multiple times a day, as opposed to only 34% in 2012. More teens also have a smartphone; 89% have one today, compared to only 41% in 2012. The study also found that social media is particularly important to teens who report a lower sense of well-being (happiness, self-esteem, etc.). Almost half of teens (46%) with low well-being report that social media is “extremely” or “very” important in their lives. Teens with low well-being are also more likely to experience cyber bullying: 35% of this group report being cyberbullied while only 5% of teens with high well-being report cyberbullying. Teens report that disconnecting from their devices is challenging. 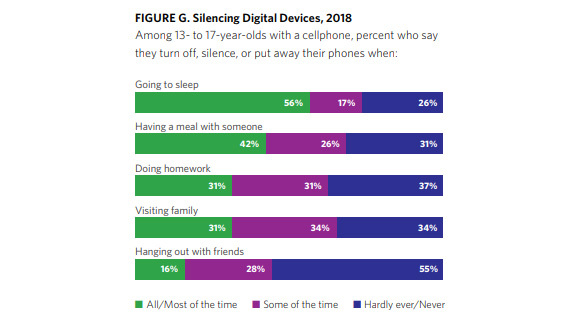 They were the least likely to turn off or put away their phone most or all of the time when with friends (16%), and most likely to disconnect when going to sleep (56%). Interestingly, a third of teens (33%) also report that they “wish their parents would spend less time on their devices.” This statistic is also on the rise from 21% in 2012. 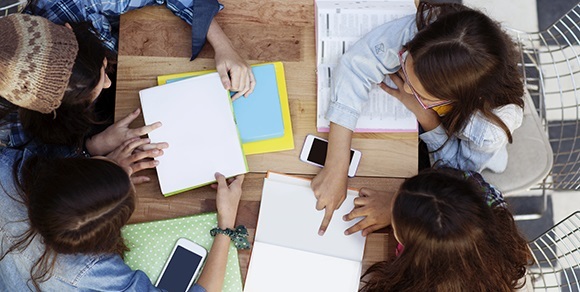 Young people use technology at home, at school, and in public libraries. Because technology is an omnipresent part of young people’s lives, they need to learn the skills to navigate technology successfully. 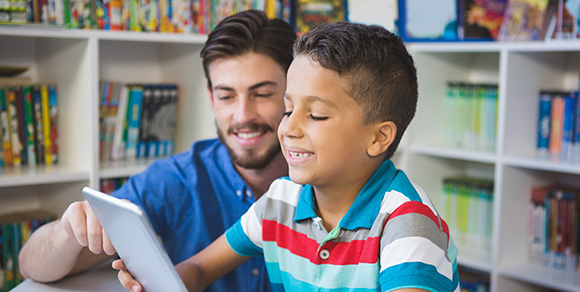 School and public libraries, in partnership with families, are both important places for teens to learn about using technology wisely and being good digital citizens. The Institute of Museum and Library Services (IMLS) recently published a report detailing the FY2015 results of the national Public Libraries Survey. This report focuses on the financial health, library use, resources, and staffing of public libraries around the country. IMLS uses two measures to determine the financial health of public libraries: total operating expenditures (how much libraries spend) and total operating revenue (how much money libraries receive in order to run the library). Both of these financial measures have been increasing since 2012 and are creeping closer to pre-recession levels of nearly $13 billion –operating revenue reached $12.42 billion in FY2015 and operating expenditures reached $11.62 billion. Nationwide, this means that public libraries received about $39.94 per capita and spent about $37.38 per capita, although these numbers vary widely by state. In Colorado, public libraries received $56.91 per capita and spent $52.15 per capita, placing Colorado in the top quarter of states for both financial measures. Library resources also rose nationally between FY2014 and FY2015, from 3.78 items per capita to 4.28 items per capita. Circulation averaged out to about 7.3 items per capita, although numbers were higher in cities and suburbs than in towns and rural areas. E-resource usage saw the most growth in FY2015. E-book use rose by more than half (53%) and use of audio materials saw a similar rise (44%). Although materials usage remained steady, physical library visits dropped slightly in FY2015. There were 1.39 billion total public library visits nationwide, or about 4.48 visits per capita, down from 4.64 per capita visits in FY2014. However, program attendance increased by 5 million people in FY2015. Colorado is one of 8 states that had more than 6 public library visits per capita (6.14) and was one of 15 states that had more than 450 attendees for every 1,000 people served attend a public library program (504.5). The entire Public Libraries Survey Report can be found here, and state profile infographics are here. The associated Library Search & Compare tool allows users to look up their own library’s information and compare it with similar libraries. LRS’s latest Fast Facts report summarizes the results of our annual investigation into the materials that are challenged in public libraries across Colorado. This Fast Facts details the number, type, and reasons for the challenges reported in the 2017 Public Library Annual Report. The information that public libraries provided to us about these challenges help demonstrate the attitude toward intellectual freedom in Colorado now and over time. The number of challenges reported in Colorado nearly doubled from last year, rising from 22 challenges reported in 2016 to 41 challenges in 2017. It is unclear whether this is due to an actual increase in the challenges that occurred, or if it is a result of more thorough reporting. Despite the increase this year, the number of reported challenges has dropped 47% in the past ten years. Keeping consistent with previous years, adult materials were challenged more often than children’s and young adult (YA) materials. About half (47%) of the materials challenged were intended for adults. Challenges for YA and children’s materials switched places, with YA challenges making up about a third (34%) of reported challenges, and children’s materials in a close third at 28%. Nearly three-quarters (72%) of all challenges resulted in no change, which has been the most common result since 2008. The top reason for a reported challenge was Unsuited to Age Group, making up nearly a third (31%) of reported challenges, replacing Sexually Explicit (25%), which had been the top reason for challenges since 2012. Offensive Language (19%), Other (19%), and Insensitivity (16%) rounded out the top five reasons for a challenge in 2017. Books were challenged more often than videos for the first time since 2014, accounting for about 3 in 5 (63%) of the reported challenges. Videos made up a quarter (25%) of reported challenges while computer (6%) and periodical (6%) challenges made up the rest. For more results from the Public Library Challenges Survey, check out the full 2017 Challenged Materials in Public Libraries Fast Facts report. And, more information about intellectual freedom issues in libraries can be found here. Pew Research Center recently published the results of its Teens, Social Media & Technology 2018 study. Pew surveyed US teens aged 13-17 to gather information about their use and views of social media, providing an update to a similar study published in 2015. For the first time, Facebook is no longer the most popular social media platform among America’s teenagers. About half (51%) of teens surveyed report that they use Facebook, down from the 7 in 10 (71%) who said the same in 2015. In 2018, higher percentages of the teens surveyed say they use YouTube (85%), Instagram (72%), and Snapchat (69%) than Facebook. The largest share of teens surveyed (45%) say that social media has neither a positive nor negative effect on themselves and their peers. About a third (31%) believe that social media has a mostly positive effect, while about a quarter (24%) say the effects of social media have been mostly negative. 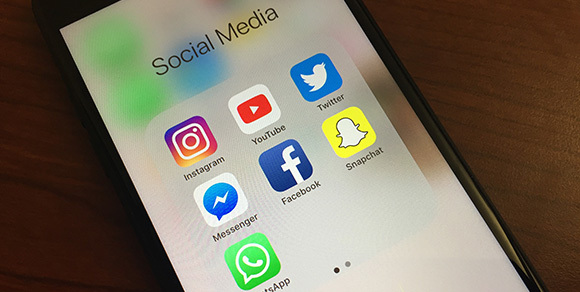 Of the teens who say that the effect of social media is mostly positive, 2 in 5 (40%) cite staying connected with friends and family as the main reason for its positive impact. Others say that social media makes it easier to find news and information (16%), meet others with similar interests (15%), and express themselves (9%). About a quarter (27%) of teens with a negative perception of social media say that social media has made it easier to bully and spread rumors about others. Other respondents believe that social media is harmful to relationships (17%), gives an unrealistic view of others’ lives (15%), or that there is peer pressure to live up to that unrealistic view (12%). The World Bank recently published the 2018 Atlas of Sustainable Development Goals. One of the United Nations’ Sustainable Development Goals is to “ensure inclusive and equitable education and promote lifelong learning opportunities for all.” A key concrete measure being tracked for the project is “total enrollment in pre-primary education, regardless of age, expressed as a percentage of the total population of official pre-primary education age.” The map above displays the rate of pre-primary enrollment by country based on the most recent data reported between the years 2011-2016. The highest percentages of enrollment in pre-primary education do not necessarily correspond to the highest income countries. The United States is considered a high income country by the World Bank. In the US, about 70% of preschool age children are enrolled in pre-primary education. 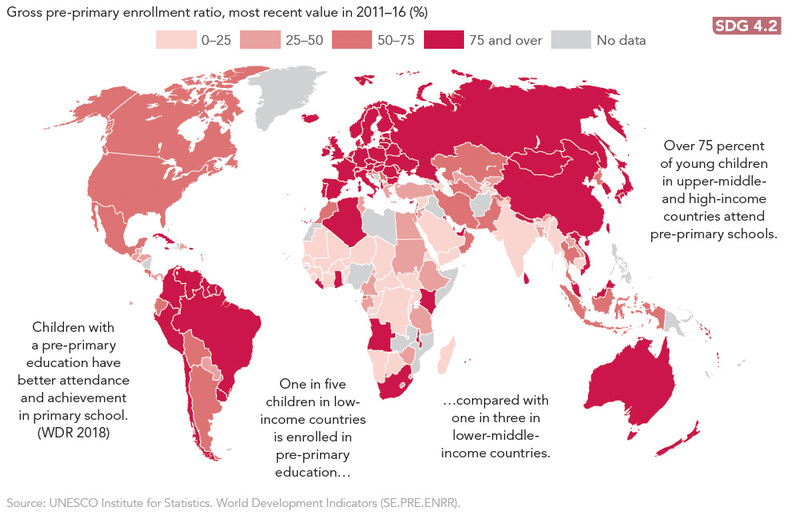 Other high income countries with 50-75% of children enrolled in pre-primary education are Canada and Oman. Many high income countries have a pre-primary enrollment of 75% or higher, including most of western Europe, Scandinavia, Australia, New Zealand, Chile, Uruguay, Japan, and South Korea. Some low and lower middle income countries (< $3,955 GNI per capita) where more than 75% of children are in pre-primary education are Mongolia, Ghana, Liberia, Sri Lanka, Ukraine, Kenya, and Vietnam. The report notes that “Children with a pre-primary education have better attendance and achievement in primary school.” With about 30% of preschool age children not enrolled in preschool in the United States, libraries can help to fill this gap by providing informal early learning opportunities to young children and their families. Library Jobline, LRS’s website for library job postings and resources, broke its own record for the number of jobs posted in 2017 while the number of job seekers and job posters continued to rise. Data collected from the Library Jobline website are highlighted in the most recent Fast Facts report. In 2017 employers posted 701 jobs to Library Jobline, an average of 13 new jobs a week. January was Jobline’s busiest month, with 73 new jobs posted. Similar to 2016, about two-thirds (67%) of the jobs posted were located in Colorado. However, the percentage of full-time jobs posted saw a big jump, from about half (53%) in 2016 to over three-quarters (78%) in 2017. The majority of jobs posted were in public libraries (66%), followed by academic libraries (21%), “other” (8%), institutional libraries (3%), and school libraries (2%). Average hourly salaries for both academic ($22.06) and public ($22.26) library positions remained steady and didn’t change much from 2016. The average salary for school library positions ($19.86) has risen 19% since its low in 2015 ($16.62). About a third (32%) of the jobs posted required a MLIS degree, while a little under half (44%) preferred a MLIS. Subscriptions to Library Jobline continued to grow, adding 407 new jobseekers and 128 new employers in 2017. This led to almost 960,000 emails with job opportunities sent to job seekers – edging closer to one million! Are you hiring at your library? In the library job market yourself? Sign up for Library Jobline as an employer or jobseeker. Jobseekers can specify what jobs they’re interested in and get emails sent straight to their inbox whenever new posts meet their criteria. Employers can also reach more than 5,000 jobseekers and more than 1,000 followers on Twitter @libraryjobline. Pew Research Center recently updated a report delving into the characteristics of the quarter of American adults who say that they haven’t read a book in the past year. This includes reading all or part of a book, in any format (print, electronic, or audiobook). 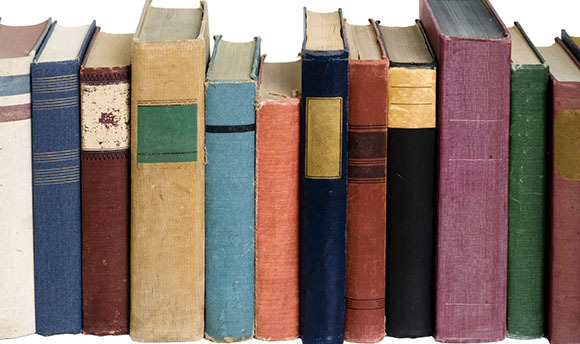 Education seems to impact how often American adults read books. About 2 in 5 (37%) adults with a high school degree or less reported that they did not read a book in the past year. This makes them about five times more likely to be a non-book reader than college graduates (7%). Similarly, only about 1 in 10 (13%) of the most affluent adults reported not reading books, while over a third (36%) of adults with an annual income of $30,000 or less said the same. Age and ethnicity also correlated with non-book reading. Nearly 2 in 5 (38%) Hispanic adults reported not reading a book in the past twelve months, compared to 1 in 5 (20%) white adults. Older adults (over 50 years old) are somewhat more likely than their younger counterparts to be non-book readers (28% and 20%, respectively). The traits that correlate to non-book reading match those of American adults who have never been to a library, as identified by a 2016 Pew Survey. In their responses to this survey, Hispanics, older adults, less affluent adults, and those who have a high school education or less were most likely to report that they had never visited a library.